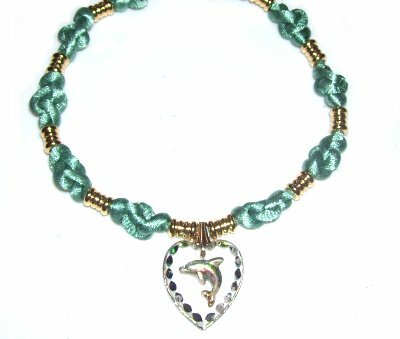 Micro-Macrame design featuring a unique type of decorative knot. You apply small beads to decorate the area between the Eternity Knots, and a pendant. Both are optional features. 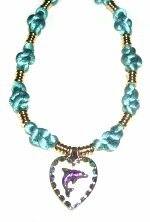 I recommend Satin cord, but other materials will work for this jewelry project. Cut one cord, at least 3 yards long for an Eternity Necklace 26 inches or less. Increase the length for sizes over 26 inches. I recommend you condition the material with Beeswax, which will stiffen it slightly, and make beading easier. Make sure the hole in the pendant is horizontal. Add a jump or split ring to the pendant if the hole is vertical. Important: When using Satin, make sure you do not pass pins through the material. Instead, lean the pins over the cord (or use tape). I recommend you make the first Eternity Knot on the surface of your board. After you are comfortable tying it, you may find it easier to hold the cord for the remaining knots. Step 1: Secure one end of the cord on your left. Move over 8 inches, and make counter-clockwise loop. Step 2: Form a bight with the working end, and pass it through the loop under - over (from below). 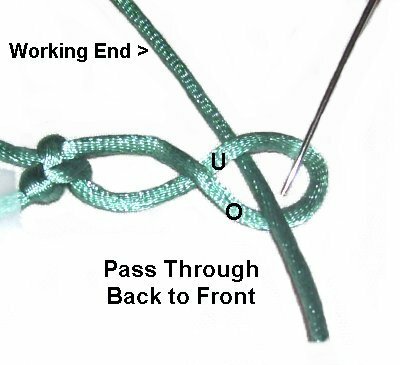 Tighten the loop by pulling on the bight. Reduce the size of the bight by pulling on the working end. Step 3: Pass the working end through the bight, right to left. Make sure it goes through from front to back, which is the same as over - under. Pull on the new loop to tighten the bight. Adjust the loop so it's around 1-inch in size. Step 4: Move the top of the loop over the bottom, to form a figure eight shape. Secure it to your board. I always lean the pin over the portion of the loop furthest to the right, since that is where the end passes through in the next step. Step 5: Bring the working end through the right portion of the loop under - over (back to front). 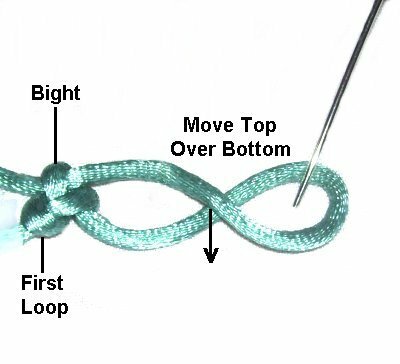 Pull on the working end close to the tightened portion of the knot, while holding the loop steady with your other hand. When it's tightened, pull on the end. Design Tip: This is one of the most challenging areas in the Eternity Necklace, because the loop can twist if you don't hold onto it. I recommend you hold the crossed area until it's resting firmly against the tightened portion. Then hold on to the right area of the loop (crook), until it's almost completely tightened. This is the completed Eternity Knot. Step 6: To make the rest of the Eternity Necklace, you just add beads between each knot, and continue. 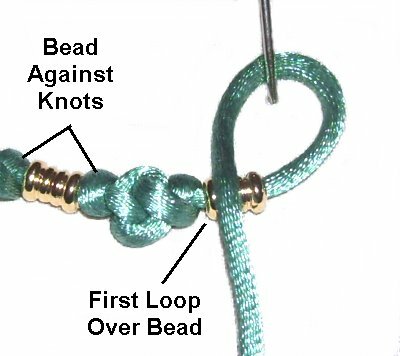 To ensure that the beads are against the Eternity Knots, form the first loop so it rests on top of the bead. 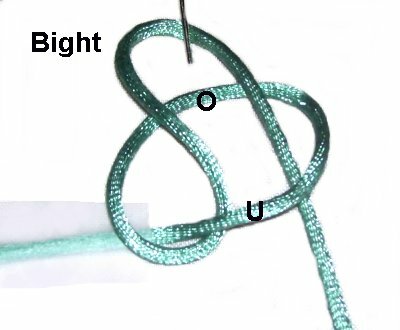 After you complete step 2 (bight), move the loop over slightly while tightening it. Tie enough knots to make half the finished size minus 3.5 inches. So if you want the completed Eternity necklace to be 26 inches, stop at 9.5 inches. 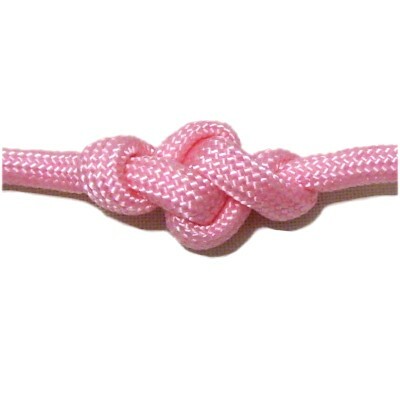 Measure from the first knot, and don't include the secured tail. Step 7: Add a bead, the pendant, and another bead. Repeat steps 1 - 6 to create the second half. The clasp for the Eternity Necklace is a simple loop and button. There are two beads present, which help hold the clasp together. Step 7: Before you make the clasp, apply glue to the back of the first and last knots. Allow it to dry completely. 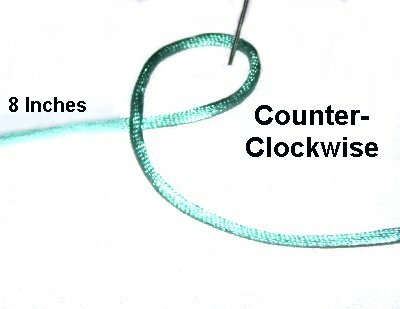 Start by folding the small piece of wire and sliding it through a bead. Pass a small piece of the material you are using through the folded area. 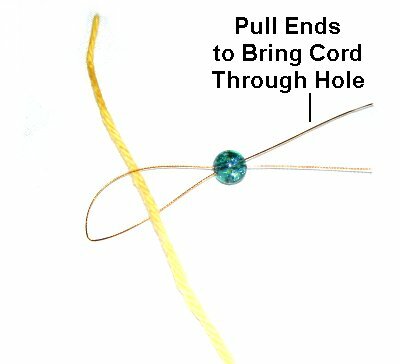 Pull on the ends to see if the cord and the wire will pass through the bead. You need different beads if you cannot get it through. Step 8: For the first half of the Eternity Necklace, pass the wire through two beads, and then place the 8-inch portion of the cord through the wire. The end (tip) of the cord should be lined up with the first knot. Slide one of the beads to rest next to the Eternity knot. Move the second bead close to the fold. Adjust the area between the bead and the fold so it's the size of the button. 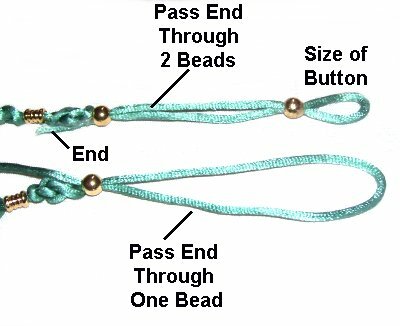 The area between the two beads should be three inches. Make adjustments by pulling on the end and moving the beads if necessary. 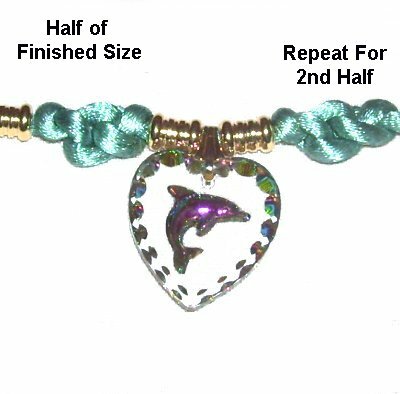 Step 8, continued: On the second half of the Eternity Necklace, repeat the same process, but pass the cord through one bead instead of two. 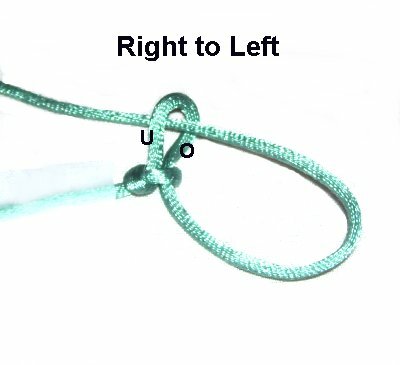 Match the first and last knots, by placing both ends side-by-side. Make sure both loops are the same size. Step 9: Check again that the button still fits through the small loop (at the end with two beads). 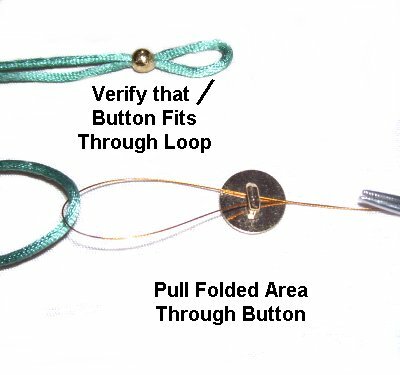 Use the wire threader or tweezers to pull the folded area at the opposite end (1 bead) through the button's shank. Turn the button and necklace so the front is face up. Step 10: Slide the button back so the folded area beyond it is as large as possible. 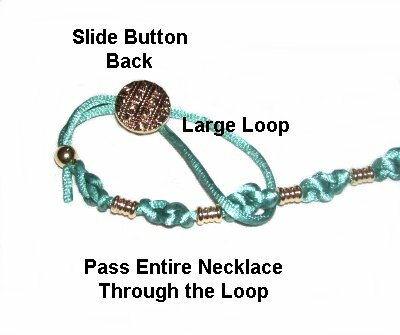 Pass the entire Eternity Necklace through the loop. This will cause the material to fold around the shank, since you are actually tying a Larks Head knot. Step 11: Make any adjustments now, since the next step will be to apply fabric glue, which bonds quickly. Slide each bead back slightly. Apply glue so it will be on the inside, then slide it back into position. Check to make sure the small loop still fits around the button. Apply glue around the shank of the button, under the cord. 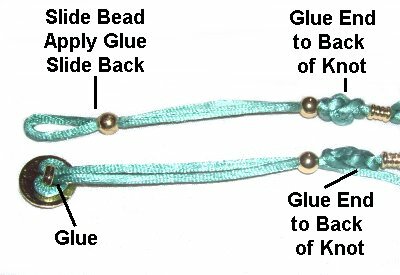 For the tips of the cord, apply glue and adhere them to the back of the Eternity knots resting next to the beads. Use clips or tape to hold the ends while the glue dries. Cut off the extra material. Have any comments about the Eternity Necklace? Contact Me.